77. Mary Dove (Madge) Byrd (James Daniel69, Eden61, Sutton55, William47, John Richard40, John35, William Thomas32, William Thomas28, Thomas26, Henry25, Thomas22, John21, John20, John18, John (Johanes)13, David12, Hugh11, David10, Richard7, Hugo6, Charlton4, Hugo3, Hugo2, Charlton1) was born 2 Dec 1851 in Pickens Co, AL, died 13 Jan 1936 in Mississippi at age 84, and was buried in Neshoba Co, MS.
General Notes: Joined the Old Pearl Valley Church in 1872 "by experience". Mary married John Frank Breazeale, son of Jefferson Barzella Breazeale and Melissa Louisa Fielder, 13 Jan 1876 in Mississippi. John was born 17 Feb 1855 in Mississippi, died 3 Oct 1946 in Neshoba Co, MS at age 91, and was buried in Neshoba Co, MS.
• He has conflicting burial information of Neshoba Co, MS.
+ 83 M i. James Jefferson Breazeale was born 19 Feb 1877, died 24 Jun 1960 at age 83, and was buried in Jones Co, MS.
+ 84 M ii. John Wesley Breazeale was born 15 Oct 1876 in Attala County, Mississippi, died 23 Dec 1948 at age 72, and was buried in Neshoba Co, MS.
+ 85 F iii. Mary Alma Breazeale was born in Sep 1880 in Mississippi. + 86 M iv. Rufus Edward Breazeale was born 29 Jan 1885, died 13 Jan 1936 at age 50, and was buried in Neshoba Co, MS.
+ 87 F v. Lillian B. Breazeale was born in Jan 1888 in Mississippi. + 88 F vi. Lola Breazeale was born 4 Jul 1889, died 7 Sep 1978 at age 89, and was buried in Neshoba Co, MS.
78. John Richard Byrd (James Daniel69, Eden61, Sutton55, William47, John Richard40, John35, William Thomas32, William Thomas28, Thomas26, Henry25, Thomas22, John21, John20, John18, John (Johanes)13, David12, Hugh11, David10, Richard7, Hugo6, Charlton4, Hugo3, Hugo2, Charlton1) was born in Feb 1861 in Neshoba Co, MS, died 5 Jan 1936 at age 74, and was buried in Neshoba Co, MS.
1936, father was Jim Byrd and his mother's name "Don't Know"
Valley Church, Neshoba County, MS.
John married Sarah Frances Breazeale, daughter of Jefferson Barzella Breazeale and Melissa Louisa Fielder, 18 Jan 1883 in Winston Co, MS. Sarah was born in 1858 in Mississippi and died in 1922 at age 64. Marriage Notes: Marriage Book 7, page 280. + 89 F i. Minnie Elzora Byrd was born 10 Dec 1883 in Neshoba Co, MS, died 11 Jan 1953 in Clarkedale, Crittenden Co, Arkansas, United States at age 69, and was buried in Winston Co, MS.
+ 90 M ii. Milton Lafayette Byrd was born 27 Nov 1886 in Neshoba Co, MS, died 1 Jun 1961 in Gulfport, Harrison Co, Mississippi, United States at age 74, and was buried 3 Jun 1961. + 91 F iii. Emma J. Byrd was born in Jun 1889 in Mississippi. + 92 F iv. Dovie Anna Byrd was born 29 Mar 1892 in Mississippi, died 27 Apr 1992 in DeKalb, Kemper Co, Mississippi, United States at age 100, and was buried 29 Apr 1992 in Burnside, Neshoba Co, Mississippi, United States. 93 M v. Andrew R. Byrd was born in Jan 1895 in Mississippi. Andrew married Mable Baratti, daughter of John L. Baratti and Elizabeth Norvelle Barrett,. + 94 F vi. 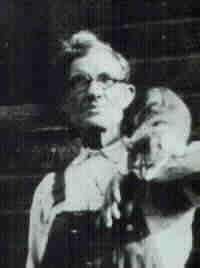 Coy D. Byrd was born in Dec 1899 in Mississippi. 80. Lucinda Jane Byrd (James Daniel69, Eden61, Sutton55, William47, John Richard40, John35, William Thomas32, William Thomas28, Thomas26, Henry25, Thomas22, John21, John20, John18, John (Johanes)13, David12, Hugh11, David10, Richard7, Hugo6, Charlton4, Hugo3, Hugo2, Charlton1) was born 20 Nov 1848 in Pickens Co, AL, died 19 Mar 1926 in Navarro Co, TX at age 77, and was buried in Mar 1926 in Corsicana, Navarro Co, Texas, United States. Lucinda married Andrew Jackson Sisson about 1866 in Mississippi. 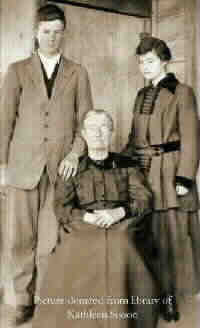 Andrew was born 18 Dec 1845 in South Carolina and died after 1900 in Texas. + 95 M i. Thomas Jefferson Sisson was born 10 May 1875 in Jackson, Hinds Co, Mississippi, United States, died 9 Jul 1940 in Littlefield, Lamb Co, Texas, United States at age 65, and was buried 10 Jul 1940 in Littlefield, Lamb Co, Texas, United States. + 96 M ii. Henry John Sisson was born 24 Jun 1877 in Jackson, Hinds Co, Mississippi, United States and died 30 Oct 1926 in Blooming Grove, Navarro Co, Texas, United States at age 49. + 97 M iii. William Willis Sisson was born 15 Jul 1870 in Jackson, Hinds Co, Mississippi, United States, died 30 Oct 1948 in Winston Co, MS at age 78, and was buried in Neshoba Co, MS.
+ 98 F iv. Hattie Mae Sisson was born 24 May 1894 in Plattsburg, Winston Co, Mississippi, United States, died 23 Jan 1971 in Lubbock, Lubbock Co, Texas, United States at age 76, and was buried in Lubbock Co, TX. + 99 F v. Martha Elmina Sisson was born 16 Jan 1868 in Jackson, Hinds Co, Mississippi, United States and died 8 May 1905 in Mississippi at age 37. + 100 M vi. Marion Sisson was born 14 Jun 1869 in Neshoba Or Winston Co, MS.
+ 101 F vii. Mary Agnes Sisson was born 18 Nov 1871 in Neshoba Co, MS, died 15 Dec 1962 in Corsicana, Navarro Co, Texas, United States at age 91, and was buried in Navarro Co, TX. + 102 F viii. Emma Jane Sisson was born 1 Mar 1873 in Winston Co, MS and died 20 Apr 1927 at age 54. + 103 F ix. Ida Victoria Sisson was born 24 Mar 1874 in Winston Co, MS and died 15 Mar 1970 in Blooming Grove, Navarro Co, Texas, United States at age 95. 104 M x. Frank Sisson was born 4 Mar 1879 in Winston Co, MS.
+ 105 M xi. Joe C. Sisson was born 11 Feb 1881 in Winston Co, MS, died 18 Nov 1941 in Blooming Grove, Navarro Co, Texas, United States at age 60, and was buried in Navarro Co, TX. 106 F xii. Bertie Sisson was born 3 Feb 1884 in Winston Co, MS.
107 F xiii. Collie Sisson was born 15 Mar 1886 in Winston Co, MS.
108 F xiv. Edna Sisson was born 15 Mar 1886 in Winston Co, MS.
+ 109 F xv. Rosa Sisson was born 27 Nov 1890 in Jackson, Hinds Co, Mississippi, United States and died 28 Jun 1971 in Dallas, Dallas Co, Texas, United States at age 80. 1. 1880 U.S. census, Neshoba, Mississippi, population schedule, Beat5, enumeration district (ED) 61, p. 534A, dwelling 6, family 7, James D Byrd; digital images, Ancestry.com (http://www.ancestry.com : accessed 8 Apr 2012); citing National Archives and Records Administration microfilm T9, roll 659. 2. 1870 U.S. census, Neshoba, Mississippi, population schedule, p. 377B, dwelling 1320, family 1320, John F Breazeal; NARA microfilm publication M593, roll M593_741. 3. 1860 U.S. census, Newton, Mississippi, population schedule, Decatur, p. 811, dwelling 811, family 826, John Bargeal; NARA microfilm publication M653, roll M653_588. 4. 1940 U.S. census, Neshoba, Mississippi, population schedule, Riley, enumeration district (ED) 50-20A, sheet 6B, household 112, Robert Clark; digital images, National Archive - 1940 Census (http://1940census.archives.gov/ : accessed 10 Apr 2012); citing National Archives and Records Administration microfilm T627, roll 2052. 5. 1900 U.S. census, Neshoba County, Mississippi, population schedule, Riley, enumeration district (ED) 46, sheet 13, dwelling 227, family 237; digital images, Ancestry.com (www.ancestry.com : accessed John R Byrd); citing National Archives and Records Administration microfilm T623, roll T623_822. 6. 1880 U.S. census, Winston, Mississippi, population schedule, enumeration district (ED) 25, p. 61B, dwelling 24, family 25, S F Breazeale; digital images, Ancestry.com (http://www.ancestry.com); citing National Archives and Records Administration microfilm T9, roll 669. 7. 1870 U.S. census, Neshoba, Mississippi, population schedule, p. 377B, dwelling 1320, family 1320, Sarah F Breazeal; NARA microfilm publication M593, roll M593_741.